Add a splash of glamour with this Iridescent soap dispenser. 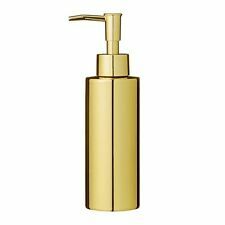 Made from shiny ceramic and fashioned with a luxe looking plastic gold pump, its a stunning addition for contemporary bathrooms. A stunning addition for contemporary bathrooms. Great design with cover flag, to avoid tissue being destroyed by your lovely pets. It's also keep your roll paper dry if your space is small when toilet is next to the your basin. 1 Toilet Paper Holder. This unusual Rose Gold Hanging Bathroom Basket shows that storage really doesn't have to be boring. This bathroom basket resembles the original design of the 'hanging egg chair' and would make a striking addition to your bathroom. This glamorous Shine range set will provide better storage and organising options for your bathroom accessories. 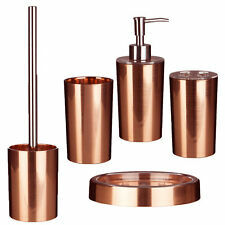 This set features a rich rose gold finish that can complement any modern bathroom setting. Built from AS plastic ensuring durability for everyday use. Liquid Pump Dispenser H18 x W8 x D7 cm Toothpaste Tumbler H12 x W7 x D7 cm Toothbrush Holder H12 x W7 x D7 cm Toilet Brush Holder H36 x W9 x D9 cm Soap dish H3 x W12 x D12 cm. New listingGOLD TAPS ! 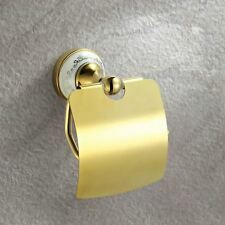 ~NOW GOLD Plughole Covers CRYSTAL HANDLE~ 4 COLOURS~ 2pcs ! (Fits STD size 38mm Plughole x 70mm O/All). CRYSTAL HANDLED. SINK WASTE COVERS ! GOLD Plated. ADD STYLE TO YOUR. 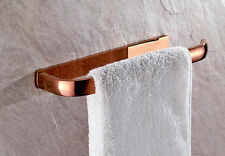 Never used Fabulous Stunning Dolphin Gold Plated Bathroom Varies Accessories. 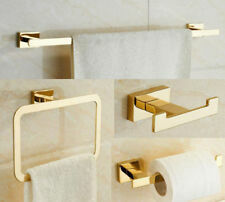 Dolphin Gold Plated Bathroom Accessories. 3 toilet roll holders, two hooks,A glass shelve With dolphins either side. Slightly scratched. No glass provided. Two dolphin wall hooks. 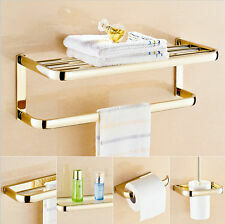 Plus a gold plated wall gold plated shower or wall shower holder. 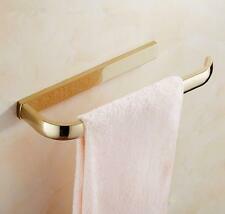 1 piece Bathroom Grab Bar. - Easy to grip handle provides strong and secure support. Good quality! Excellent Service! - Durable solid brass construction in an old world bronze finish that creates antiqued look. Equipped with drip-free ceramic disc valves for long life and smooth feel. -- Blends quality and durability with elegant style. Our faucets/shower set. GOLD TAPS ! ~ NOW GOLD 'Petite' CRYSTAL HANDLE Plughole Covers ~ NEW !